Left to right: John & Mary Costello, Andrew Young, Catherine and James Young, Alexander (Sandy) Young, George Young. 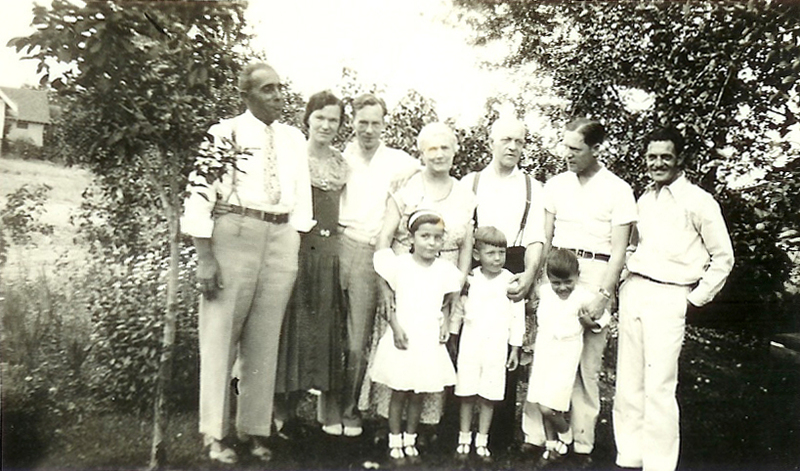 Front row: Mary & John’s three children – Virginia, Dan and Vince. A few weeks ago I wrote a post about my great grandfather John Costello who is currently a brick wall. Brick wall?! More like a steel reinforced concrete wall surrounded by razor wire. Well, maybe not really. But it feels like it somedays. 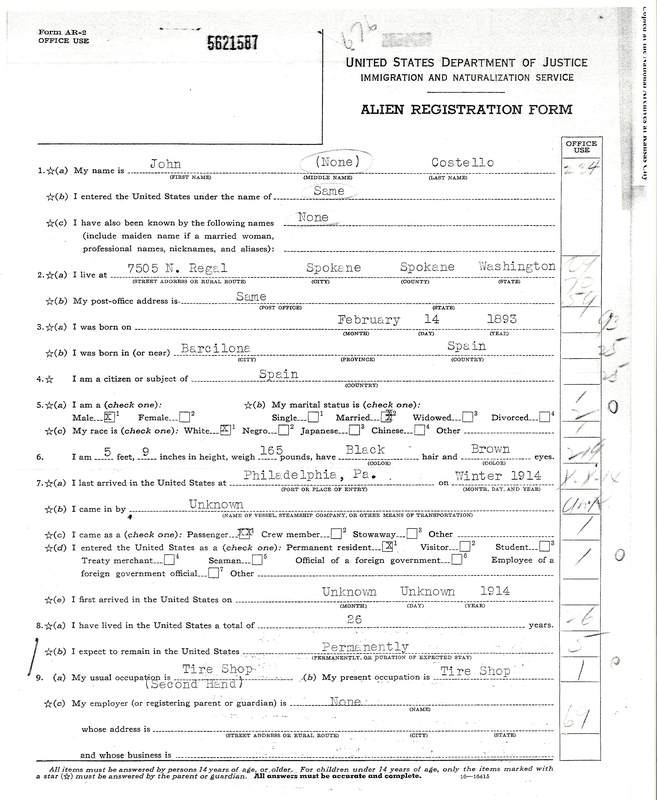 Last Saturday a copy of his Alien File arrived from the National Archives in Kansas. I was soooo excited – giddy really. The slender, four page file had seemed like such a wonderful possibility. And as I looked at each page my giddiness slowly faded until at last it sputtered out completely. The slender file of possibilities in fact held very little. There was a physical description – Height – 5’9″, weight – 165 lbs., Black hair, & Brown eyes. This was new-ish. I knew some of it and could have guessed at some of it. It does say that he arrived in Philadelphia in the winter of 1914 – different from what his children have shared with me. I did learn that he claims he was a passenger on the ship but can’t remember the name of the ship. Okay. He claims that he entered the US under the name John Costello and has used that name all of his life. Interesting – some of his children claim his name was Juan Castilla and that he changed his name to John Costello. The file itself has two documents that he signed. Look at these John Hancocks – what do you see? Is it just me? Does that second signature look like it says ‘Juan’? Below are the images from the four pages of his file. I guess the bottom line is that I turned over another stone. I may not have found what I was looking for – but I have one less stone to turn over. And that, well it’s something at least. Looks like Juan to my eyes too. What a bizarre mystery. 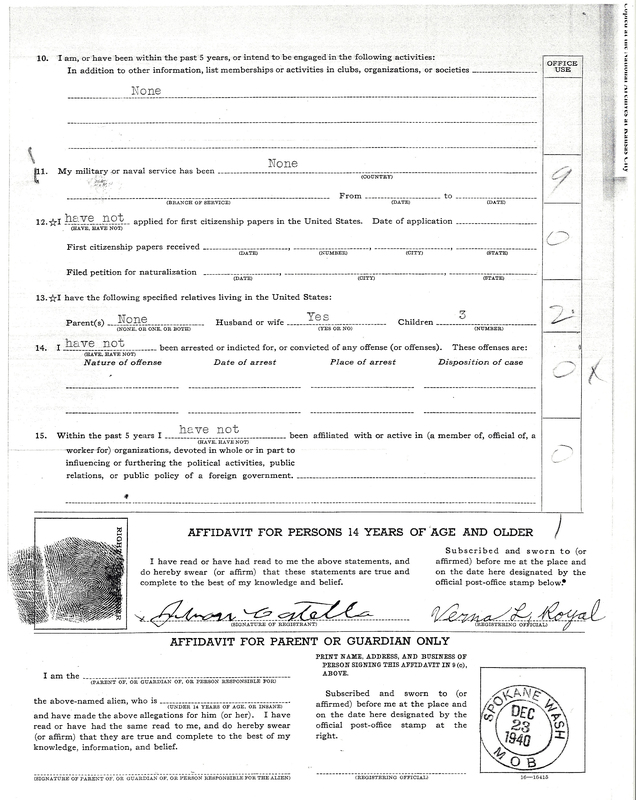 Two questions come to mind: Why did he wait so long from the time of his arrival before he filled out the Alien Registration Form – 1914 to 19040? Did some law change or was it related to the war? You mentioned in another post that no one in the family knows his parents’ names, and as far as they know, had no correspondence with them after he arrived here. Any idea why he cut all contact? This is very intriguing! I’m glad I’m not the only one who sees Juan! Thanks for the validation. I read something about the laws surrounding Alien files but it didn’t stick well. I do think the law came around 1940 but I’ll have to look. His daughter says that he went every year to update his file/register with the Alien office. We do ‘know’ his parent’s names but I haven’t found any documents that prove that the names we know are accurate. If the stories from his children are accurate, he didn’t run from his family but from farming. He wanted a different/better life and they were happy for him. The lack of contact is supposed to be about the fact that none of his family were literate. Such a mysterious set of circumstances! Definitely looks like Juan to me on the second signature! But I feel the disappointment! Some years ago I ordered my Dad’s father’s WWII service record, when it arrived there was a letter with it saying that much of his file had been lost when he had been applying for a disability pension at the end of the war so there was only a few pages of coded information which I did get deciphered with some help. What I had really been hoping to find was a reason behind his ‘compassionate leave’ he was granted in 1944 – no members of his or his wife’s family had died at that time and I wanted to understand what it was for. Nothing. Although it did provide some info, it was still a little disappointing – so I know how you feel! Thanks for your support. I’m sorry you didn’t get the answers you were looking for either. One of the difficulties of being an avid genealogist is that in our efforts to be thorough we usually find more questions than answers. If only we could be less curious we wouldn’t be disappointed. I suppose I’d rather be curious and occasionally disappointed. It’s so interesting this way.